This is a delicious vegan quiche made with tofu instead of eggs. You can also use real cheese instead of soy cheese if you prefer. Cook the onion, garlic, mushrooms, and spinach in a pan for about 3-5 minutes or until they soften. Prepare the crust according to the instructions on the package (some crusts require that you pre-bake them for a few minutes prior to filling. Mix the tofu, salt and pepper, and almond milk in a blender until soft (about the consistency of a milkshake). Mix the tofu blend, cooked vegetables, and cheese in a mixing bowl. Fill the pie crust with the mixture. 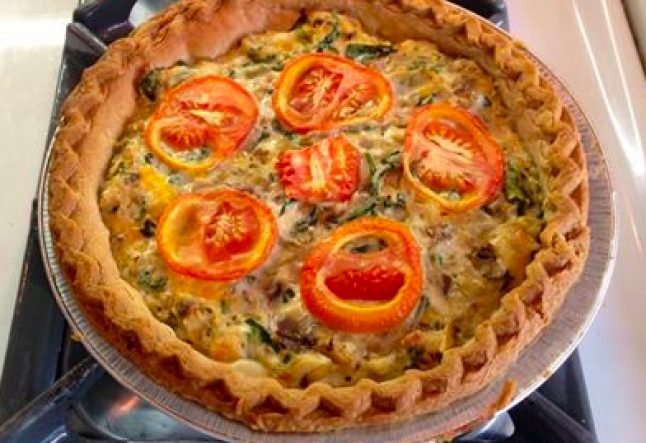 Add a few slices of tomato on top (just enough to add a layer on top of the quiche). Let sit for ten minutes after removing from the oven. Enjoy!